Liliana Rojas-Suarez is a Senior Fellow at the Center for Global Development and the Chair of the Latin American Shadow Financial Regulatory Committee. From March 1998 to October 2000, she served as Managing Director and Chief Economist for Latin America at Deutsche Bank. Before joining Deutsche Bank, Ms. Rojas-Suarez was the Principal Advisor in the Office of Chief Economist at the Inter-American Development Bank. 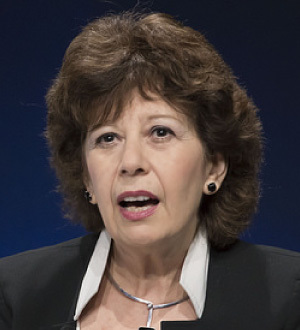 Between 1984-1994 she held various positions at the International Monetary Fund, most recently as Deputy Chief of the Capital Markets and Financial Studies Division of the Research Department. She has been a Visiting Fellow at the Institute for International Economics and has also served as a Professor at Anahuac University in Mexico and an Advisor for PEMEX, Mexico’s National Petroleum Company. Ms. Rojas-Suarez has also testified before a Joint Committee of the US Senate.on the issue of dollarization in Latin America. Ms. Rojas-Suarez has published widely in the areas of macroeconomic policy, international economics and financial markets. Her most recent publications include: Can International Capital Standards Strengthen banks in Emerging Markets (IIE, 2001), Why So High? Understanding Interest Rate Spreads in Latin America (ed. With P. Brock, IDB, 2000), “What Exchange Rate Arrangements Work Best for Latin America”, World Economic Affairs, (Autumn 2000) and Financial Regulation: Why, How and Where Now? (With C. Gooddhart et al, Routledge, 1998). Ms. Rojas-Suarez holds a Ph.D. in Economics from the University of Western Ontario. Rojas-Suarez, Liliana (2015) “Changes in Funding Patterns by Latin American Banking Systems: How Large? How Risky?”, Banco de España. Rojas-Suarez, Liliana (2015) “Emerging Market Macroeconomic Resilience to External Shocks: Today versus Pre–Global Crisis“, Center for Global Development. Rojas-Suarez, Liliana (2014) “Towards Strong and Stable Capital Markets in Emerging Market Economies”, Center for Global Development. Rojas-Suarez, Liliana; Izquierdo, Alejandro; Loo-Kung, Rudy (2013) “Macroprudential Regulations in Central America”, Inter-American Development Bank. Rojas-Suarez, Liliana; Montoro, Carlos (2012) “Credit at Times of Stress: Latin American Lessons from the Global Financial Crisis”, Center for Global Development.